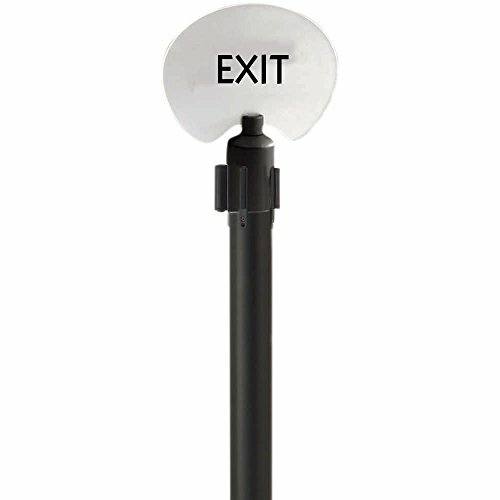 Keep your crowds under control with this frameless "Exit" stanchion sign. The bold, black on white lettering which reads "Exit," will help to point your patrons in the right direction when things gets busy. This stanchion sign is a great way to organize lines and queues at your movie theater, food truck, concession stand, hotel, or restaurant. Designed to fit an A-line retractable belt post (sold separately), this stanchion sign features a unique, contemporary oval form which will catch the eye of all your customers. This easy-to-read sign is able to be quickly attached to its compatible stanchion post with little effort. With this frameless oval stanchion sign, crowd control has never been more sleek or simple.